Heath Cummings gives you one sleeper outside of the top 300 in ADP for every team. Each year I put this list together and try to start by looking back at the successes and failures from the year before. Walker Buehler was the star of the list in 2018, but he was far from the only hit. Gleyber Torres and Jesse Winker performed like stars for part of the year, and guys like Cesar Hernandez, Nathan Eovaldi and Stephen Piscotty outperformed their cost. Of course it wasn't all rainbows and unicorns. Injuries derailed possible breakouts from Michael Kopech and Austin Hays. Poor performance plagued veterans like Hanley Ramirez and Felix Hernandez. When you're choosing from players outside of the top 250 as I was last year, you're going to tout a lot of players who end up being bad. But it's worth it for the gems we find. This year I'm going just a little bit deeper, to players who have a consensus ADP outside the top 300 on Fantasy Pros. As always, I'll give you my favorite from each team with a short write-up on my favorite in each division. This year I've also added a few honorable mentions, because several teams have more than one good choice. I've always thought Michael Pineda was better than his career ERA, so it should come as no surprise Pineda is my favorite in a division that is a little light on deep sleepers. Pineda missed all of 2018 due to Tommy John surgery and could be eased in, but he has a ton of upside once he's a full go. Pineda's biggest problem in New York was the long ball. He gave up 68 home runs from 2015-17, which helps explain how he always had an ERA above four and an xFIP in the low-to-mid 3.00s. The positive in the past has been his outstanding control and good ground-ball rate. That should play well in his new park, and the parks in the Central are generally more pitcher-friendly than those in the East. If he can get back to full strength and limit the home runs, Pineda could be a must-start pitcher with enough strikeouts and good ratios. His only full season in Seattle he posted a 3.74 ERA and a 1.10 WHIP over 171 innings. Honorable Mention: Ryan O'Hearn, Brad Keller, Triston McKenzie, Matthew Boyd, Joe Jimenez, Chris Owings, Blake Parker. Hays is a repeat from last year and he's also my favorite deep sleeper in this division. Scott White wrote earlier this spring about Hays' hot spring and I was worried people would start drafting him. Thankfully, the Orioles decided to send him to the minor leagues to start the year, so the secret should stay safe for a little while longer. Hays offers what few players in Baltimore actually can — hope. He hit 32 home runs as a 21-year-old in 2017 and looked ready for the majors before an injury cost him the first half of the 2018 season. He didn't have quite the pop last year, but he did hit 12 long balls in 66 games at Double-A. This spring he was the best hitter the Orioles had with a 1.277 OPS and five long balls. It may be May before we see Hays, but there's no one on the roster who should stand in his way. Camden Yards is a great spot for power hitters, and I'd expect a loud arrival once the Orioles deem him ready. Honorable Mention: Jonathan Loaisiga, Cedric Mullins, Eduardo Nunez, Brandon Lowe, Brent Honeywell. It feels a bit like cheating putting Brad Peacock on this list because he actually never falls this far in our drafts. Peacock looks like he'll be the fifth starter for the Astros, so let's look at what he did in 2017 as a starter. He made 21 starts for the Astros that year and posted a 3.22 ERA and a 1.22 WHIP. He struck out 135 batters in 111.2 innings. That's the stuff of aces. The only issue at all with Peacock is innings. His innings per start will likely be among the lowest in the league for good pitchers, and there are so many pitchers nipping at his heels in Houston there's a real risk he doesn't make 30 starts. 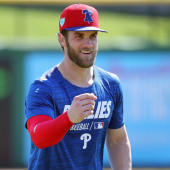 I expect Peacock will be a borderline top-30 starter for as long as he's in the rotation and that's plenty of reason to draft him 100 spots higher than his current ADP. Especially in CBS points leagues where he's eligible as a reliever. Honorable Mention: Kyle Tucker, Isiah Kiner-Falefa, Justin Bour, Zack Cozart, Taylor Ward, Framber Valdez, Daniel Vogelbach, A.J. Puk. A week ago I would have told you pretty confidently that Tyler O'Neill was going to be my favorite deep sleeper in this division. Then the Pirates named Jung Ho Kang their starting third baseman. Kang hasn't played regularly in the majors since 2016 due to legal troubles and injuries, but when he's played he's shown some really interesting skills. In 843 career plate appearances he has a .274/.355/.482 slash line with 36 home runs. The projection systems are mixed on him but both THE BAT and Steamer project him for an OPS over .800. He's definitely an option as a starting corner infielder, and he may just play his way into the top-12 discussion at third base if he hits like he did the last time we saw him. Honorbale Mention: Mitch Keller, Steve Cishek, Eric Thames, Corbin Burnes, Keston Hiura, Freddy Peralta. I'd originally highlighted Touki Toussaint in this section because he seemed like the safest young Brave to end up in the rotation. Unfortunately that wasn't the case. The truth is, the Braves have almost a full rotation worth of guys who you could put in this column, and I'd still target Toussaint late in drafts. But Kyle Wright is probably the better deep sleeper now because he's going so much later and he's actually in the rotation. Wright doesn't have the strikeout upside Toussaint does, but he's shown much better control in the minor leagues. And he's struck out 151 hitters in 155 minor league innings, so it's not like he can't miss bats. He should have a good defense behind him and plenty of run support, plus he has RP-eligibility. AT the very least Wright is a SPARP to watch in April. Honorable Mention: Touki Toussaint, Mike Soroka, Luiz Gohara, Zach Eflin, Caleb Smith, Seth Lugo, Lewis Brinson, Jeff McNeil. Pablo Lopez. This is a division full of really good options. In fact, one of the hardest decisions was deciding whether to go with Luke Weaver or Steven Souza. Both had far more value after the 2017 season than they do now, and I expect a bounceback season from both. But Weaver won the battle, so let's talk about him. He spent the offseason working on his new curveball, and so far the results have been pretty fantastic. In 11 spring innings he's struck out 10, walked none and given up just two runs. Until 2018 he'd always shown well above-average control, and that's what I expect again in 2019. With a new curveball and a new home, I expect Weaver to establish himself as a top-50 starting pitcher with upside beyond that. Honorable Mention: Steven Souza, Mac Williamson, Alex Verdugo, Wilmer Flores, Luis Urias.